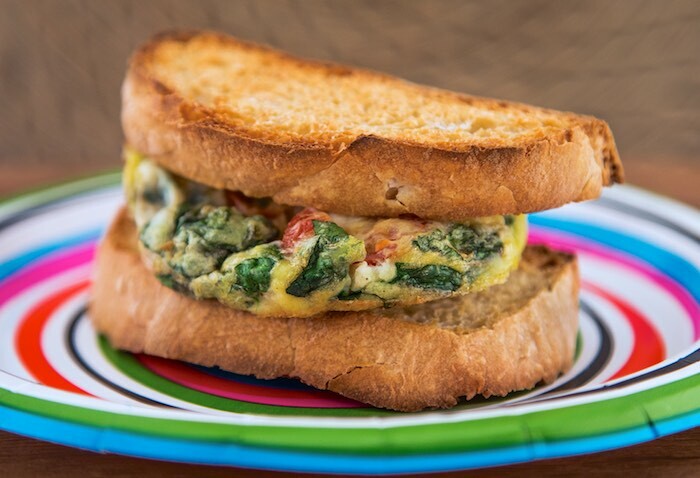 If you like breakfast sandwiches then you will love my Italian Eye Opener; a grab-and-go breakfast sandwich done up Italian style. Eggs loaded with healthy greens, Parmesan cheese and tomatoes...what's not to love? Preheat oven to 375 degrees. Coat six wells of a cupcake pan generously with butter or cooking spray. In a medium bowl, beat eggs and milk until color is uniform. Stir in salt, pepper and Parmesan cheese. Place two sliced tomatoes and a small amount of spinach into each buttered muffin cup. Fill each cup about three-fourths full with egg mixture. Bake 14-16 minutes or until centers are barely firm to the touch and the tops of the muffins have domed. Remove from oven and let cool 2-3 minutes in pan. Remove from pan and serve immediately between two slices of toasted Italian bread or sandwich bread. One of my husband's favorite things to cook on the weekend is breakfast sandwiches. I'm passing this one along to him to try out next! I love egg sandwiches and like your Italian version! It's like an omelet sandwich. I LOVE it!!! We love all things Italian in my house so I know my family would love that filling! This looks fabulous! It also looks like what I ate growing up with my Italian family :) Love it! This is exactly the way I want to wake up. Every. Single. Day. Love the Italian twist...and the more spinach the better! I'd be happy to eat this for any meal of the day! Sounds like a great way to start off the day. Healthy and hearty? What's not to love! Love breakfast sandwiches and this is such a delicious sounding version! This would definitely give me something to wake up early! Delicious! This has my husband's name all over it! He love a good hearty breakfast sandwich! I would love to have this for breakfast! I wish I started my morning with this! I would eat this all of the time. My kind of sandwich for sure. Love the name! Such a hearty savory meal! I've been all about savory breakfasts these days. Must be winter! A nice big sandwich is always a great way to start the day! My partner is half Italian, I bet he would love this! I'd love to try these with Follow Your Heart's new vegan egg product. What a great breakfast to go! I'm going to try a vegan version of this and Cheryl will eat the vegetarian one. I love a good hearty savory breakfast! It's my favorite! Delicious! I love how you've combined all the yummies right into the egg, creative! Totally agree...what's not to love here? YUM! Wow! I should always eat breakfast before perusing your posts!